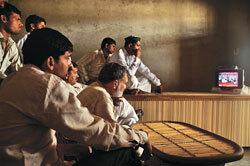 In a room inside the mill, a group of farmers had crowded before a television set. Chief Minister Mayawati was addressing a press conference, broadcast live on a channel. As she began to blame the farmers for the recent wave of violence in Uttar Pradesh, they became agitated. One of them left the room to inform others. Just then a cavalcade of tractors and sports utility vehicles entered the mill to join the mahapanchayat called by farmer groups. The event was supposed to be a grand affair, but the police had stopped many farmers and their leaders in Aligarh and Meerut. Those present deliberated on the recent violence in Bhatta and Parsaul villages in Greater Noida and the Uttar Pradesh government’s land acquisition policy. They then decided to march to the villages to express solidarity. But the party was soon accosted by state police and Rapid Action Force units. 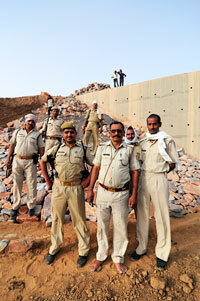 Uday Vir Singh, a senior police officer, threatened to use weapons if the farmers continued with their march. A heated argument ensued but in the end they struck a compromise. Eight members were divided into three teams and allowed to enter the villages, escorted by the police. Farmers of villages around Greater Noida have been on the warpath ever since the state government began forcible acquisition of land in 2007. A semi-constructed expressway connecting Greater Noida and Agra has opened up new possibilities for real estate companies along the transit corridor. Since 2003, the state government has notified 1,215 villages in the districts of Gautam Budh Nagar, Agra, Mahamaya Nagar, Aligarh, Mathura and Bulandshahr, all in western Uttar Pradesh, for acquisition for Yamuna Expressway, a 165-km highway project. 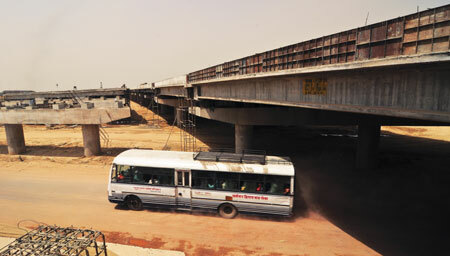 It will reduce the travel time between Greater Noida and Agra to less than two hours from the present four hours. About 1,000 villages have already handed over land, but farmers are not happy with the compensation. Landless farm workers have not been given anything. The Yamuna Expressway Industrial Development Authority (YEA), the nodal body overseeing the project, wants to develop 44,000 hectares (ha). 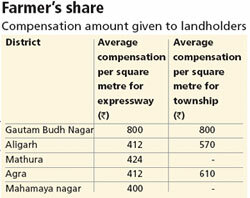 Of this only 9.3 per cent is for the expressway and the rest for developing areas around it, also called land parcels. About 4,100 ha has been given to Jaypee Infratech Limited, a subsidiary of Jaiprakash Associates Limited, to build the expressway and 2,500 ha to develop five land parcels. Since 2007, when land acquisitions began, the development of the road corridor has been marked by clashes between the police and agitating farmers, and occasional highway blockades and baton charge. Farmers also filed petitions in the Allahabad high court demanding cancellation of the acquisitions. But the cases were quashed. On May 7, tension reached flashpoint. In the twin villages of Bhatta- Parsaul the police and farmers clashed after the farmers took two officials of the state transport department and their driver hostage. The officials were visiting the area to conduct survey for a new bus route. The village residents mistook them for officials involved in land acquisition. They were released on May 8. In the two intervening days, Bhatta-Parsaul was transformed into a war zone. The police fired at the farmers, sometimes indiscriminately; the farmers initially responded with sticks and stones. The police say the farmers also fired at them. The people could not match the state’s fire power and fled. Official figures say four persons died in the firing— two policemen and two farmers. Between May 9 and May 12, Bhatta-Parsaul had no men. They had run away fearing the police, or were admitted in hospitals, or were under detention. Twenty-two villagers were sent to Dasna jail in Ghaziabad. The police had blocked entry roads to the villages. Section 144 of the Code of Criminal Procedures was imposed, which forbids more than five persons from assembling at a place. Soon after the clash, politicians streamed into the twin villages. Senior Bharatiya Janata Party leaders Rajnath Singh, Arun Jaitley and Mukhtar Abbas Naqvi, Lok Janshakti Party chief Ram Vilas Paswan, Uttar Pradesh Congress Committee president Rita Bahuguna Joshi and BKU leader Rakesh Tikait were arrested while trying to make their way into the villages. So was Congress leader Rahul Gandhi, who entered the villages pillion-riding a motorcycle. In an extraordinary move even Prime Minister Manmohan Singh announced that those injured seriously would get a compensation of Rs 50,000 while those with minor injuries would get Rs 10,000 each. A similar agitation had taken place in November 2010 at Tappal in Aligarh when farmers and the police clashed over land acquisition for a proposed township. Farmers relented after the state government announced it would hike land rates for acquisition and provide annuity as rehabilitation. Land in the western Uttar Pradesh belt is up for grabs for private developers. The acquisitions have increased remarkably since December 2007. Besides the Yamuna Expressway, numerous townships are springing up. Land for these townships is being given to companies as special incentives to develop infrastructure in the area. Land rates, decided by the district magistrate, depend on factors like distance from the road and the city, and presence of water supply and sewerage. The compensation amount is based on these rates. In the villages of Gautam Budh Nagar, for instance, rates of farmland were around Rs 85 lakh per hectare till 2010. Land in villages that are far from the city like Bhatta, Parsaul and Acheja costs Rs 61 lakh per hectare during the same period. The rates have suddenly shot up this year. According to revenue officials, the cost of land in the villages of Gautam Budh Nagar increases to Rs 1.20 crore a hectare if it is developed as a farmhouse. The proposed map of Yamuna Expressway shows many new projects are waiting (see map). Apart from the five parcels of land, most of which has already been acquired by Jaypee, there is a proposal for a sports special development zone comprising a Formula One race track. Also lined up are cricket and hockey stadiums, besides apartments. Jaypee states it would develop 35,000 ha between Greater Noida and Jewar, 60 km away, for industries, information technology institutes, warehouses, sports and transport. This does not include small housing projects. A search through different websites reveals that more than a dozen estate developers, including big names like DLF, Unitech, Parsvanath, Eldeco, Emmar, Omaxe and Wave, have either been allotted land to develop residential and commercial property along the expessway or are in the queue. But the development is taking its toll on the farm sector. Most of the land being diverted to real estate projects is highly fertile. The development will affect almost 1.4 million people in 850 villages between Greater Noida and Agra, complained Ajit Singh, Rashtriya Lok Dal president and member of Parliament from Baghpat, in a letter to the prime minister after the Bhatta- Parsaul incident. He expressed concern over the Uttar Pradesh government’s plan to build eight expressways on a similar economic model. Big plans are under way for the Ganga Expressway, a 1,047 km stretch from Ballia to Greater Noida which would cost about Rs 30,000 crore. The Uttar Pradesh Expressways Industrial Development Authority will acquire 26,374 ha. It has already notified 1,949 villages for acquisition. While 15,120 ha would be used to construct the expressway, 11,254 ha would be given as land parcels to the company that wins the bid. 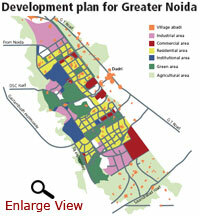 Greater Noida, too, has big development plans. Greater Noida Industrial Development Authority (GNIDA), formed in 1991, has been mandated to develop this area. According to the Authority’s masterplan 21,570 ha will be acquired by 2021 for purposes other than agriculture. Greater Noida has 40,000 ha land. 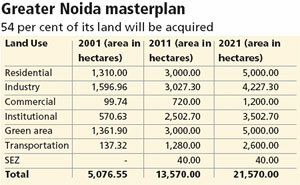 This means, GNIDA proposes to acquire 54 per cent of the land (see ‘Greater Noida masterplan’,). Every plot sold translates into big revenue for GNIDA. The Authority has therefore, in some way, assumed the role of a real estate agent. Its annual budget for 2010-11 testifies this. The total earning of GNIDA, mostly from leasing and selling land and property, was Rs 1,360.10 crore. It earned Rs 512.12 crore from selling residential plots, and another Rs 394.19 crore from selling and leasing land to private builders. Simply put, it is raining money for both GNIDA and private developers. It is the farmers who have been short shrifted. A Greater Noida farmer gets about Rs 820 per sq metre for parting with his land. As the distance from Greater Noida increases, the amount decreases. In Tappal, for instance, a farmer gets Rs 570 per sq metre for his land (see ‘Farmer’s share’). The amount a Greater Noida farmer gets translates to about Rs 8.2 million per hectare. When the same land is developed into apartments, the cheapest rate the Authority gives to a developer is Rs 35,000 per square metre or Rs 350 million per hectare. Property agents concur, saying the profit after land acquisition, cost of construction, and other value additions is between 90 per cent and 110 per cent per square feet (1 sq ft=0.09 sq m). GNIDA and YEA officials refused to comment. A day after the violence in the twin villages, 19-year-old Firdaus Bibi of Bhatta recounts the events. Her father, an agricultural labourer, had no land of his own. He worked in the fields of landed farmers for a living. His savings helped him build a small concrete house for his family in the village. Things were looking up when YEA acquired the land he worked on. Real estate prices have gone up significantly, say Greater Noida Industrial Development Authority (GNIDA) officials. In 2008-09, the authority sold land for residential purpose at Rs 10,500 per square metre, for group housing and township at Rs 10,000 per square metre, and for commercial purpose at Rs 20,000 per square metre. In just two years, the authority raised the prices to Rs 11,550 for a square metre of residential plot, Rs 11,000 per square metre for group housing, and Rs 22,000 per square metre for commercial purpose. However, it is private players who are making maximum profit. Apartments usually fetch a minimum price of Rs 35,000 per square metre. It goes north from here depending on the amenities and the development the builder has carried out. Development of the expressway and expansion of the Delhi Metro is sure make land holders and real estate developers in Greater Noida happier. With land gone, he feared livelihood would go too. Shaukeen and his 17-yearold son, Naeem, joined the other farmers in the protests. But both were shot in their legs and admitted to a nearby hospital. Firdaus’ mother has been away for four days now, tending the two at the hospital. Shaukeen and his family had shifted to Bhatta about 20 years ago. Like all daily wage labourers, they were given a small piece of land. “Our monthly income was about Rs 5,000. We also got food and other benefits from land owners,” says Firdaus. “Without land, there will be no work for us. Resettling at another place is not an easy option,” she says. The condition of 55-year-old Munni is no better. All her four sons used to work as daily wage labourers on the fields in Bhatta. They have been missing since the violence on May 7. “The police had set afire many straw houses that store grains in the farms. I suspect my sons got killed in it or have been arrested,” says the worried mother. 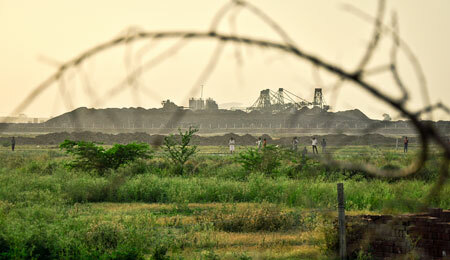 Land acquisitions have put the migrant labourers of Bhatta in serious trouble. Most are jobless now and plan to migrate to cities, she rues. BKU spokesperson Dharmendar Singh cites several reasons for farmers being unhappy. “They were not consulted at any stage of acquisition. Instead, urgency clause under Section 17 of the Land Acquisition Act was enforced,” he says. The clause allows government to acquire land without giving land owners the right to a hearing. “There is no uniformity in the land rates offered to farmers. In Greater Noida, farmers got much more than what those in Aligarh received for the same project,” he adds. The Bhatta-Parsaul incident highlights that all acquisitions have been made on agricultural land, leaving the farmer in the middle of a concrete jungle (see map). Some farmers have sought other forms of employment, but illiteracy may take them nowhere. While the acquisition has left landless labourers without means of livelihood, it has also created millionaires among the landed. Take the case of Parshu Ram, an 80- year-old resident of Acheja village. In 2009, the Uttar Pradesh government acquired his farmland to build the Yamuna Expressway. The compensation he got was much more than what he could have ever made as a farmer. He received Rs 1 crore for little more than one hectare. But the money has only added to his problems. Ram sips from a glass of water and quips with a tinge of rustic philosophy: “You will never understand how it feels to become landless.” He does not know how to spend the money he has got. For the past 65 years all he had done is farming. 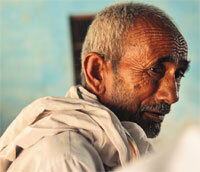 There are others like 75-year-old Sardar Sharma of Kirpalpur village in Aligarh. He laments selling his land but says there was little he could do. Of his 7.5 ha land, he sold 5.25 ha for the expressway for Rs 2.99 crore. “My four sons are not interested in agriculture. They want easy money so that they can all move to the cities. I have given Rs 20 lakh to each one of them,” he says. The sons do not want to “ruin their lives in the village”. 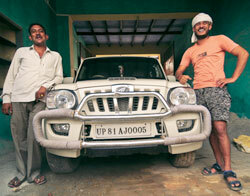 Bhoora Singh, a farmer at Kher tehsil in Aligarh, wants to build a big house and buy a Mahindra Scorpio. He received Rs 2 crore for signing away his land on April 15, 2011. “Money from farming is very little,” says the middleaged man. He tried to sell his land to real estate agents in 2002, but was offered only Rs 75 lakh for 6.5 ha. “Today I am a crorepati,” he remarks. The violence in Bhatta-Parsaul villages is a reminder of smaller clashes in western Uttar Pradesh since 2007 over land acquisition. 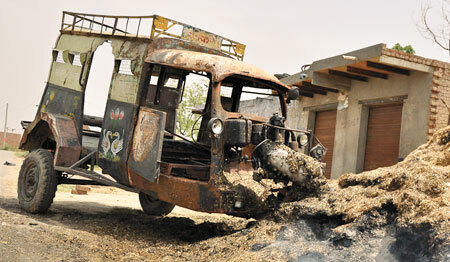 In August 2010, Tappal block in Aligarh saw similar protests, leading to a clash between farmers and the police. The compensation given to these farmers against land acquired for the Yamuna Expressway and a high-tech city was a fraction of the profits made by the private developer to whom the land was transferred. To placate the agitating farmers, the Uttar Pradesh government announced a new land acquisition and rehabilitation policy on September 3, 2010. It also promised to stop the construction of the township. The policy offered sops to the farmers in addition to land compensation. These included equity shares in the development projects and an annuity of Rs 20,000 per acre (0.4 hectare), which would be increased by Rs 600 a year, for 33 years; alternatively farmers were offered a one-time compensation of Rs 2.4 lakh per acre. One person in each family would be entitled to employment with wages totalling Rs 1.85 lakh over a period of five years, the policy said. The state cabinet secretary said no land would be acquired from farmers without their consent and that the price of land under acquisition would be finalised through a negotiated settlement with the owner. It was touted as the “best land acquisition policy, which beats that of any other state”. But the policy has not seen the light of the day. “It can become the law only after the Centre passes the draft bill,” says Bhure Lal, retired Uttar Pradesh cadre bureaucrat who served in the tribal affairs ministry and the prime minister’s office. 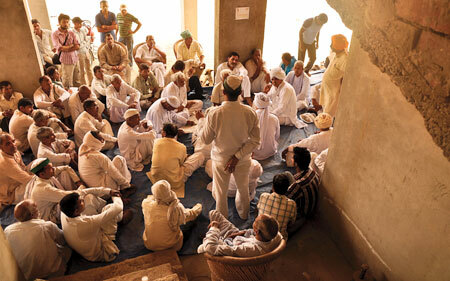 Farmers in Tappal and the twin villages of Bhatta-Parsaul complain the government is buying land from them at less than a third the prevalent rate and selling it at high profits to private firms. But the Uttar Pradesh government says it is offering farmers better land rates than the Centre. A statement released by the state soon after the violence in Bhatta-Parsaul, said it pays farmers Rs 44 lakh per acre in Noida, Rs 36 lakh per acre in Greater Noida and Rs 22-35 lakh along the Yamuna Expressway. On the other hand, the railway ministry is offering only Rs 2.9-Rs 4.35 lakh per acre for land for its coach factory in Raebareli; the National Highway Authority of India paid Rs 9.6-Rs 22 lakh per acre for broadening the National Highway 11 in Agra. Real estate agents say the price difference reflects the market rate; there is little demand for land in Raebareli while land values in Noida and Greater Noida are much higher. Farmers who lost land to the Yamuna Expressway say they want better compensation. They say the land the government bought from them for less than Rs 800 per sq metre in Greater Noida was sold to private developers at 10 times the rate they got. Under the existing laws, private parties cannot buy agricultural land directly from farmers for non-agricultural purposes. The state government has to notify its land use change. This change is what leads to escalation of land prices. “The increase in price of land, just on the basis of land use change, is the crux of the dissatisfaction among farmers,” says Bhure Lal. He adds that fixing of circle land rates to be paid to farmers has always been contentious because it is based on the previous three registrations of land sale with the tehsildar at the time land is acquired. This rate may not reflect the prevalent land rate. After all round condemnation by political parties over the way the Uttar Pradesh government handled the agitation in Greater Noida, the state was quick to shift the blame on the Centre for failing to convert the Resettlement and Rehabilitation (R&R) policy into a law. On May 12, Union home minister P Chidambaram promised to introduce amendments to the Land Acquisition Act of 1894 and a draft R&R bill in the next session of Parliament. The twin bills could not be cleared in Parliament on two previous occasions—in 2007 and 2009—due to lack of consensus. The Land Acquisition Act of 1894 is the basis for acquiring land across India; the R&R policy of 2003 is a statement of intent which some states have adopted. Anita Choudhary, secretary of the department of land resources in the Union rural development ministry, says the government is working on amendments to the Act and the R&R bill. Deputy secretary in Choudhary’s department, Harpratap Singh, says till date, future value of land was not taken into account at the time of fixing the rate of purchase from the farmers, but now the ministry will try to consider it. Another proposed amendment will take into account the acceleration of land prices between the time of notification and the acquisition. Section 6 of the Act stipulates that the price of land for acquisition be fixed at the price prevalent at the time of notification. Now, the price may be calculated after notification “to give farmers better compensation”, says Singh. Civil society groups object to retention of certain clauses in the amendments and R&R drafts (see www.downtoearth.org.in for drafts and their critique). One of these is the “urgency” clause contained in Section 17 (1) of the Act which allows the government to acquire land without going through the procedures described in the Land Acquisition Act, which provides that people whose land is acquired should be heard. Under the provision, the government can acquire land within 15 days of notice. “Urgency has neither been defined nor illustrated in the Act. The provision effectively sanctions the bypassing of procedural mechanisms in the Act and goes against democratic rights and Constitutional principles,” says Madhuresh Kumar of the National Alliance of People’s Movements, a network of non-profits. Activists say 17 (1) is the most misused section. A recent Supreme Court order, in fact, pulled up the Uttar Pradesh government for invoking the section for acquiring 205 hectares in Greater Noida and scrapped the acquisition (see ‘Property is a right: SC’, Down To Earth, May 15-31, 2011). The court also questioned the Greater Noida Industrial Development Authority for invoking the section to acquire land for the expressway project. Activists are also opposing the clauses “eminent domain” and “public purpose” in the Act. Eminent domain refers to the powers of the state over all property within the state, and specifically the power to take over private property for a public purpose. It makes the government the sole arbiter of what constitutes public purpose. The Land Acquisition Act amendments define public purpose as provision of land for works vital to national security; for infrastructure projects which benefit the general public; or for other purpose useful to the public for which 70 per cent of the land has been bought by a person (or company) and remaining 30 per cent needs to be acquired. In recent years, the government has increasingly used this clause to benefit private corporations, says Kasturi Kannan, independent researcher and writer. The proposed amendments in the Land Acquisition Act make acquiring land for private interests easier and more difficult to challenge. Vijayan M J of non-profit Delhi Forum says there is hardly any difference in the 2007 and 2009 draft bills despite the civil society group making over 50 representations to Parliament’s standing committee on rural development, which was supervising the bills after the 2007 drafts were rejected in Parliament. He says the ministry did not incorporate any of the suggestions and changes. “All arbitrary benchmarks used in the 2007 drafts are replicated in the 2009 drafts as well. For instance, the provision that the need for rehabilitation would arise only if more than 400 people are displaced in the plains and more than 200 people in the tribal hilly areas remains unchanged in the second set of drafts,” says Vijayan. 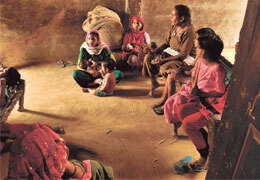 Delhi Forum had suggested that all families displaced should be rehabilitated. He adds that the proposed amendments completely neglect landless farmers. The 2009 R&R draft mandates both social impact assessment and environmental impact assessment. But at the same time it stipulates that these would be needed only if more than 400 people in the plains or 200 people in hilly areas are displaced. What is happening in Greater Noida was witnessed in the case of the Bengaluru-Mysore expressway which connects the two cities of Karnataka. Of the total land acquired for the project, only one-third was required for the expressway. The rest was sold to private developers. Kannan says initially when land was acquired for public purpose it meant roads, railways and infrastructure. Now it includes private companies as well. As for the R&R bill, it is just a copy of the 2003 policy, says advocate Usha Ramanathan, research fellow at the Centre for the Study of Developing Societies, a think tank in Delhi. The bill has many ambiguities. For instance, it says land will be provided to the displaced if available, which means there is no guarantee. Ramanathan says the existing policy cannot be enforced because it is not the law; even states like Uttar Pradesh, Punjab and Haryana that have adopted the policy have not made it a law (see ‘Punjab resettlement policy slightly better’,). In their present form, the land acquisition amendments and the R&R bill may not get farmers a fair deal. Uttar Pradesh’s neighbour Punjab has a better defined resettlement and rehabilitation (R&R) policy. It is based on the principle that the “affected persons are not worse off on account of a project than they were before”. But the policy still sticks to the archaic idea of “eminent domain” and acquiring land for “public purpose”. Unlike the Central policy where R&R is meant for the landed, the Punjab policy acknowledges and distinguishes between title-holders, non-title holders, tenants and community, and compensates each category of people. In Punjab, a land owner can be compensated in three ways: paying the prevailing market cost of the acquired land; direct negotiations with a buyer; and paying circle rates with additional financial assistance if acquisition is for public purpose. The entitled persons are eligible for training and severance allowance of 25 per cent of the award value. They get registration and stamp duty charges equivalent to the area acquired for the project. In case of tenants, the whole family gets benefits. These include a four month notice period to allow harvesting of crops, two months notice for vacating the property and a transitional allowance for three months at the average wage rate (AWR) in Punjab. Each family gets a shifting allowance of Rs 1,000 and can salvage structural material from their houses. Those belonging to vulnerable groups receive emergency rehabilitation grant for nine months towards reestablishing livelihood at AWR of Punjab (calculated for 30 days in a month). Tenants losing source of livelihood get training (one person per family). One person from share-cropper/contract cultivator/wage earner family gets training. Contract cultivator farmers are eligible for entire crop loss assistance. Assistance for crop loss shall be paid in the ratio of 1:2 between the land owner and tenant in case of share-cropping. Perennial crops/fruit trees and wells are to be compensated for if adequate notice is not given. Community land like religious structures, cremation grounds and graveyards are to be replaced or reconstructed at project cost in consultation with the community and panchayats. Activists say the Punjab policy only tries to minimise damage and does not minimise land acquisition itself. “It legitimises land acquisition and does not ensure rehabilitation takes place before land acquisition begins,” says Vijayan M J of non-profit Delhi Forum. Land acquisition of farmland is going on throughout India. The irony is that the government is thinking about infrastructure development but at the cost of food security. While the idea of infrastructure is in mind of the government, do they have any idea how they are going to increase production of food grains with the shrinking farmland. The food prices are already escalating and with the shrinking farm this is going to escalate further. Apart from it, the writers have also brought in the point about landless labours which is really an issue. If you talk about a farmland, it's not only the farmer's family but dozens of families who work on the farm who are affected by the land acquisition. A bigger article on farmland acquisition throughout the India is what is required. Such a piece can give a big jolt to the government giving a wake up call. I congratulate the authors for bringing in the plight and dilemma of the farmers in the article. I'm happy that Down to Earth has kept it's tradition of highlighting the farmers issues but would request you to do a bigger story on farmland across India. idiots are being fooled by giving them pea nuts of compensation , they should have got 30 times more as compensation .